Abstract: Evidence suggests that growth in providers’ prices drives growth in health care spending on the privately insured. However, existing work has not systematically differentiated between the growth rate of hospital prices and that of physician prices. We analyzed growth in both types of prices for inpatient and hospital-based outpatient services using actual negotiated prices paid by insurers. We found that in the period 2007–14 hospital prices grew substantially faster than physician prices. For inpatient care, hospital prices grew 42 percent, while physician prices grew 18 percent. Similarly, for hospital-based outpatient care, hospital prices grew 25 percent, while physician prices grew 6 percent. A majority of the growth in payments for inpatient and hospital-based outpatient care was driven by growth in hospital prices, not physician prices. Our work suggests that efforts to reduce health care spending should be primarily focused on addressing growth in hospital rather than physician prices. Policymakers should consider a range of options to address hospital price growth, including antitrust enforcement, administered pricing, the use of reference pricing, and incentivizing referring physicians to make more cost-efficient referrals. Hospital and physician prices for four hospital-based procedures and for total inpatient and outpatient care between 2007 and 2014. 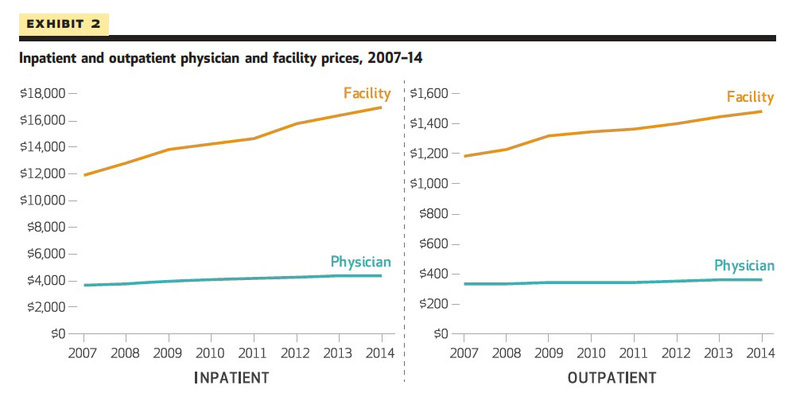 Inpatient and outpatient physician and facility prices between 2007 and 2014. 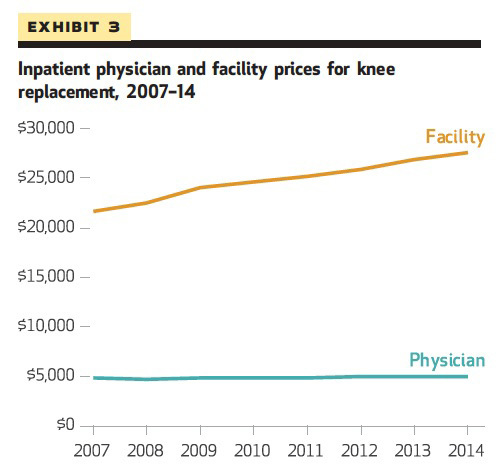 Inpatient physician and facility prices for knee replacement between 2007 and 2014. Physician and facility prices for four hospital-based procedures between 2007 and 2014.